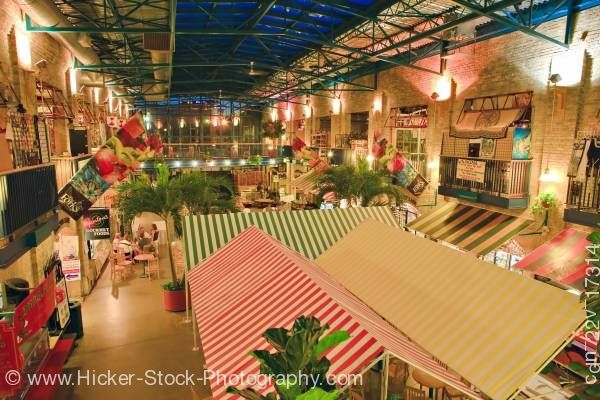 This stock photo shows the interior of The Forks Market - a National Historic Site in the City of Winnipeg, Manitoba, Canada. The Forks Market offers a multitude of shops to browse for a wide variety of specialty items and souvenirs. Downstairs, The Market features an irresistible fresh food emporium with everything from gourmet cheeses to meats organic baked goods and wine. In the upstairs Hayloft, shoppers will find items ranging from cigars and aromatherapy products to crafts and artworks from 300 local and Canadian artisans. A constantly changing array of artisans and vendors also sell their wares at day tables inside The Forks Market and outside on The Plaza. Every Saturday morning from 9:30am - 12:30pm select Market tenants will have something extra special to sell.